Disclosure: I got this product as part of an review opportunity. I have crazy frizzy, wavy, thick, obnoxious hair. Thanks to generous use of hair products and a flat iron, I don't normally look like my hair is nuts, but it really is. Remember this before picture from an earlier post? That's what I look like after air drying. It's much worse blown dry. I try round brushing but round brushing ones own hair is tricky. I simply don't have enough arms. My hair is so frizzy that I'm always trying new products to tame the madness. My stylist swears by Aveda's Smooth Infusion product line and Moroccan Oil, but I still struggle to get those fabulous salon results at home. 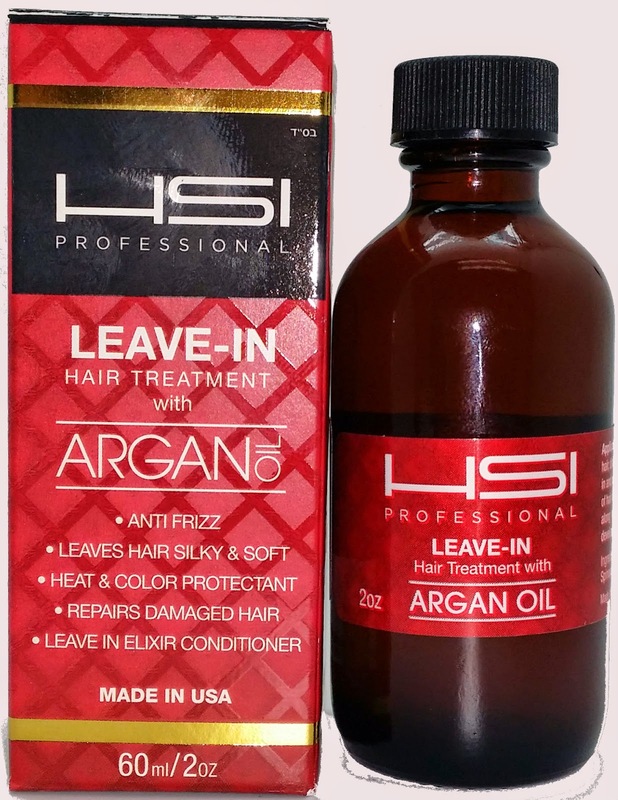 HSI Professional sent me a sample of their Argan Oil Leave-In Hair Treatment. As a leader in heat styling products, I had high expectations of their oil leave-in treatment. I tried first on damp hair and then on dry hair. I tried styling flat and leaving frizzy. The flat iron seemed to help set in the smoothness, but I can't say my hair looked any better than with other argan oil products I've tried. One particularly frizzy day, I decided to make myself a relaxing spa bath at home. While soaking, I dampened my hair and added nearly half the bottle (approx 1oz) to my hair and let it sit with a hair cap on in the steamy bathroom for about 30 minutes. I then washed and dried as usual. That did the trick. My hair was smoother, shinier, and softer. See below, just air dried with no added product. I can't say it would be worth it for me to spend that kind of money to dump half a bottle in my hair once or twice a month, but it's tempting. The overall softness lasted about a week before it was back to the usually craziness. The thing is, while I could do this at home, my salon stylist would be happy to do a conditioning treatment with similar results when I come in for my hair cuts every other month. It would be hard to justify buying the HSI oil just for this. I can't speak for everyone, so take this as my opinion. You might find HSI's argan oil treatment works really well with just a few drops. Everyone's hair is different. HSI recommends using their argan oil as thermal protection with heat styling tools. It's not too greasy, doesn't build up residue, and is suitable for all hair types. For more information about HSI, check out the HSI Facebook page. I received a sample of HSI argan oil for free using Tomoson.com. Regardless, I only recommend products or services I use personally and believe will be good for my readers.